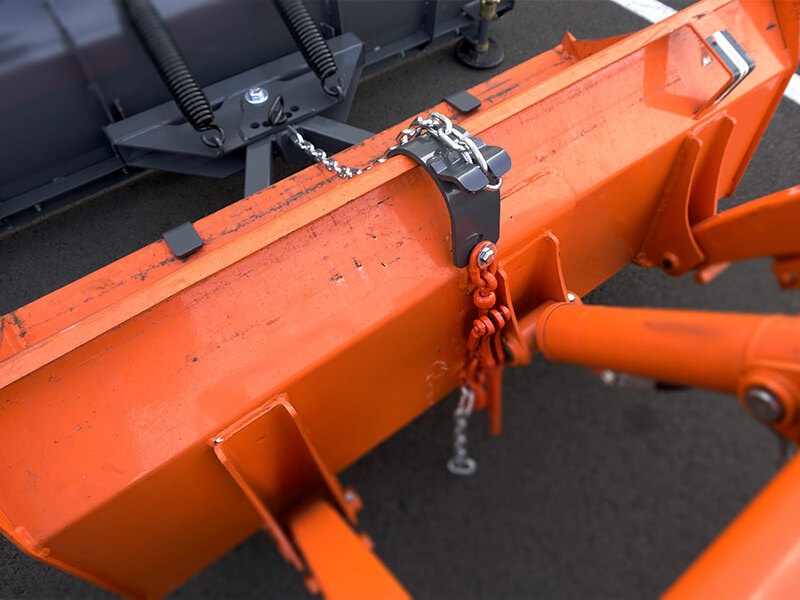 Attaches to your Front Loader bucket in seconds with no tools! No drilling, etc. required! Installs in seconds with no modifications to your tractor or loader. Allows your loader to remain on the tractor and available for use in about 15 seconds. Blade floats independent of the loader bucket. 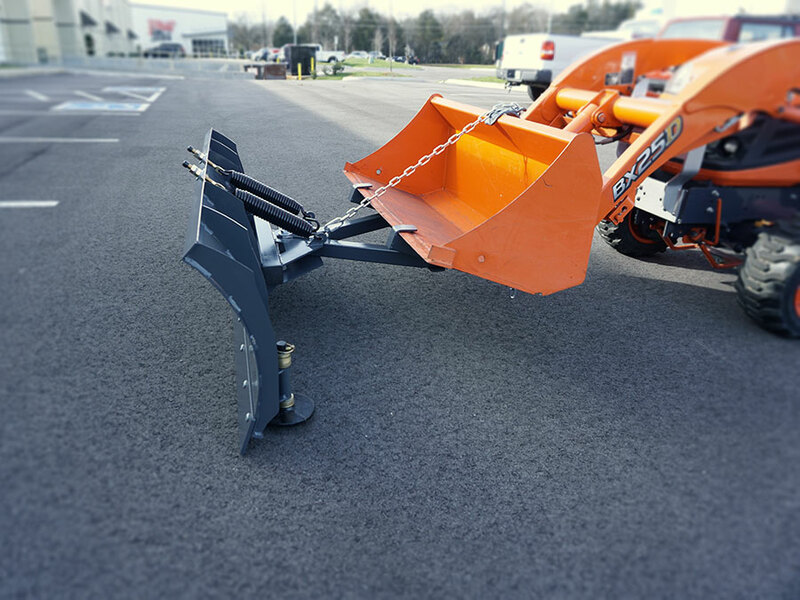 The loader can apply down pressure if needed for removal of packed snow or ice. 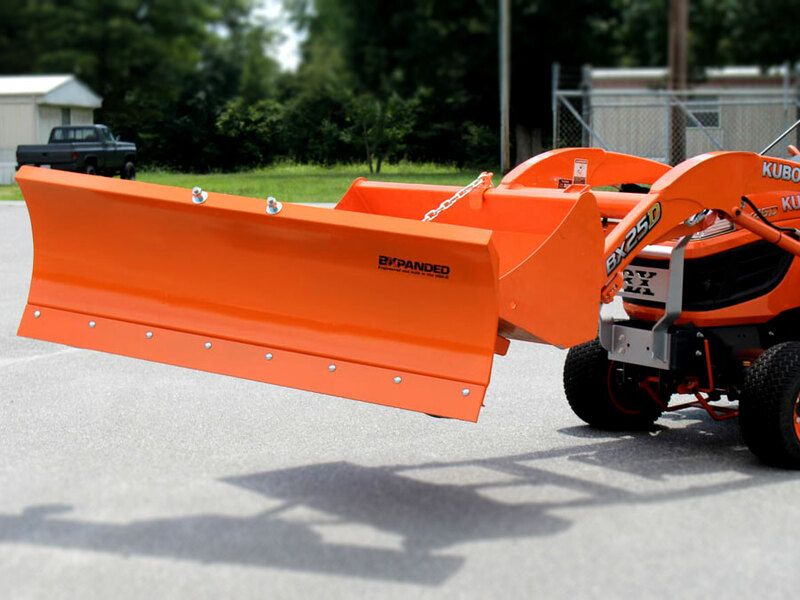 The angle of attack of the blade can be changed by manipulation of the loader bucket. Can be offset approximately 8 inches to either side to allow snow to be pushed farther off the road. Ships UPS or FedEx Ground right to your door eliminating the hassle and high cost of Motor Freight. The blade is 72" wide, approximately 21" high. The blade angles 0, 15 or 30 degrees left or right. The moldboard is sturdy steel and is equipped with trip springs and a replaceable edge. Cutting edge is replaceable and is made from heavy 3/8" thick steel. Heavy duty cast skid shoes are available. Standard color is Charcoal Gray. Orange, Red, Blue or Yellow Blades are available. Wheeled Storage Dolly (cart) is available to make storage and installation a breeze. Pricing: Standard blade complete with mounting system, 3/8" steel cutting edge, and all hardware: $1075. Skid shoe mounts and heavy duty cast skid shoes: $89. Optional color: Orange, Red, Blue or Yellow: $50. I bought a competitive blade 3 years ago and it was junk. Just bought the Bxpanded blade for my B2920 and its quality is head and shoulders above the other blade. I can't wait for the snow! I bought this blade for my B3200. Assembly and installation was a snap. Just used it on the first real snow this year and it performed flawlessly. Wish I had this setup when I lived in Pennsylvania! I got it put together in an hour or so, and it installs on the bucket in less than a minute. I missed most of the snow this winter by the time I finally ordered the blade, but I got to use it on about 8" of wet, heavy snow. No problems whatsoever, and after clearing my driveway, I did the cul de sac at the end just for fun. The blade appears very well-made, and the removable cutting blade is a great idea for long-term use. I couldn't be more pleased. I just wish I'd pulled the trigger on it earlier in the year. Have had a long gravel driveway anf had been clearing snow with a 60" rear mount blower but it was slow work. I got the 72" plow and what a world of difference. 3 times faster than the blower and does a better job. I orginally did not order the shoes, but you need them so had to get them later. I have now concreted my whole driveway and am really looking forward to the snow coming. Great plow. After 10 years of plowing with a 5' grader blade on the back, I got the 6' plow for the front. We get a lot of snow, but it usually comes only a few inches at a time for 6 months. We have had 3 snow storms with a foot or more snow this winter so far! My BX2230 is handling it just fine. Glad I got the bigger plow. Our snow is dry and light, if it was wet heavy snow it would probably be too much. 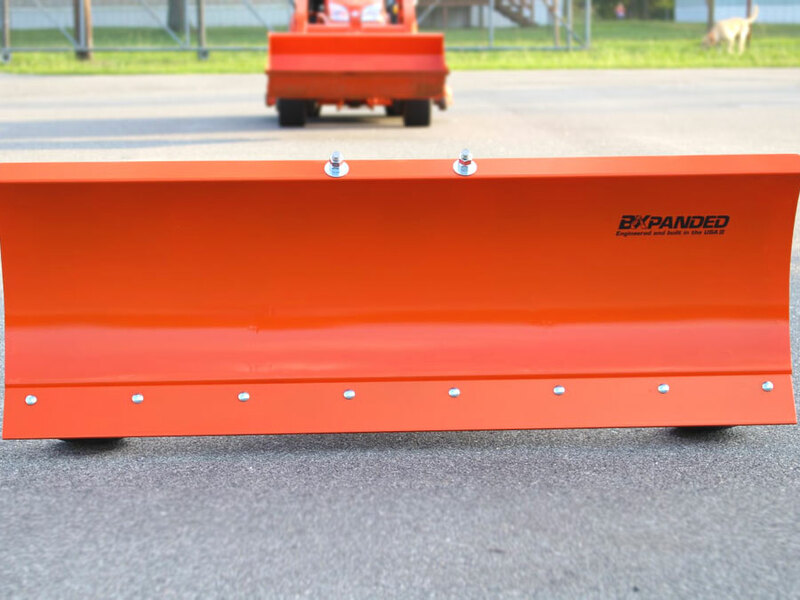 Just recieved my snowplow today. Finished assembly and it looks very well built and heavy duty enuogh to take some punishment. Its quick and easy to attatch. The assembly instructions could have been a little bit better but were ok. A couple of bolts were missing to the scraper blade because they were put in a thin ziplock sandwich bag and taped to the box which UPS probably had ripped open before they got out of their parking lot. Could have easily put them into the box with the rest of the plow hardware. First Ordered the 60 inch Plow, but I own a Kubota L2501, so I emailed them I wanted the 72 Inch Plow instead. They called me via Cellphone the next day and switched the order. Very pleasant to talk to . They make the plows to order I guess and I waited about two weeks for it to arrive. My order was delivered in very good packaging and was in very good shape. I used it today, we had about 6 inches of "wet" and "heavy" snow last night. The first snow fall of the season. It was easy to assemble and attach to my Tractor's Bucket. It plowed snow like a "champ." It seems very well built. It operated just as good as my "Boss" Plow on my Chevy truck. I highly recommend this product to anyone who owns a tractor with a FEL. It is my "back up" when my Son borrows the Truck's Plow to clear his property. We can get up to 14 inches of snow in a Season, so I will definitely be putting it to the test. Thanks Bxpanded, well done. This is fast becoming my favorite attachment to my Kubota. It is very well made and a cinch to attach to my tractor. I plowed about 3" of slush and this plow did a great job. 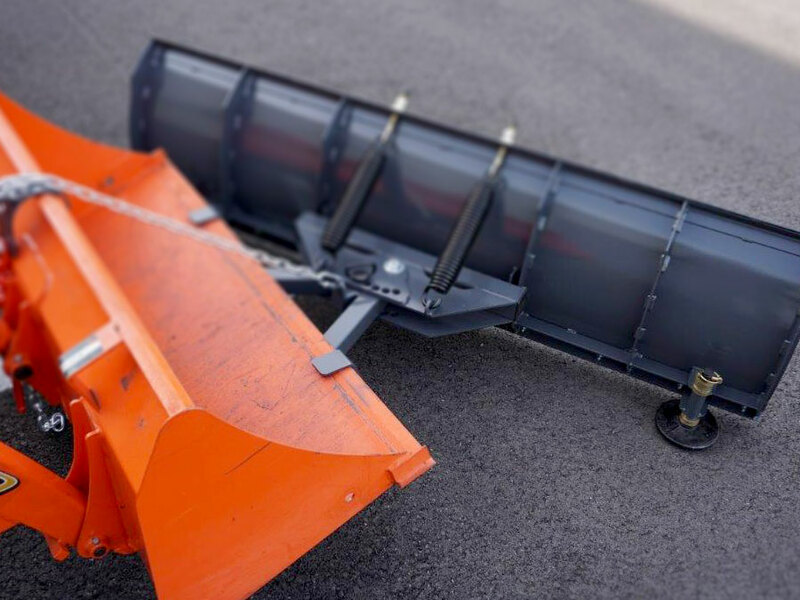 I looked at other plows that used a strap to secure it to the bucket. I think the chain binder that secures the plow to the front bucket is the only way to secure it! I wish I had bought it years ago. Bought the 72" version in October of 2018. Have used it to plow all winter, mounted on my 35hp 02' Kioti 4WD tractor. Plow is exactly as advertised and works great. Have had lots of snow in VT this year, starting in November. It's the first week of March now, and we're still getting significant snowfall. Have 500 feet of driveway, plus a large parking lot by my house that holds a dozen cars. In the past, I used an 700cc ATV with 50" plow to clear my driveway. Worked "okay," but took a lot of time. This new set-up does a better job and has cut plowing time in half. Lots of "Pros" here: High quality, well built, rugged, simple to use/adjust. Like how plow floats in front of bucket/follows ground contour. Like ability to install/remove plow quickly, by myself, with no tools required. Like that I can mount the plow off-center in my bucket, which extends it 18" past the side of the bucket and lets me wing back the snow banks when they get too high. I assembled the plow by myself in about 45 minutes. This plow would be a bargain if it cost half again the selling price. 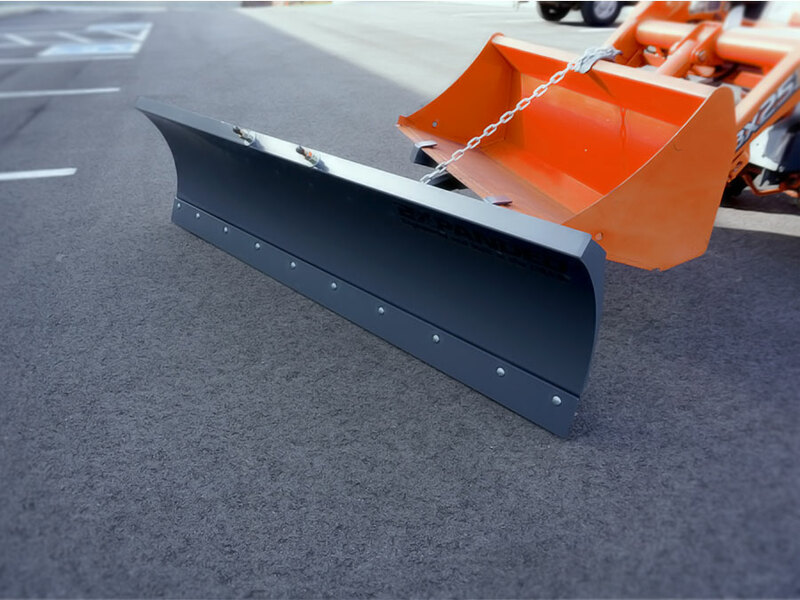 A: The 72" Plow weighs approximately 235 pounds. Either the 60" or 72" works well with the BX. Was this answer helpful? 10 of 14 Customer(s) found this Answer helpful. Q: Looking to purchase the 72 Inch Snowplow for my Kubota B7610 tractor. I've always liked the mounting design with the chain binders and free float. I was interested to know if the top support chain was not in place would the plow hang vertical underneath? This would be great since I have limited space in my garage with 2 harleys and would allow me to install the plow and leave it dangling/resting under bucket until time to plow. A: Yes. It would hang vertically under the bucket.